The season finale for the winter season is this weekend at the Florida Horse Park, and while some of the snowbirds have migrated north, plenty of top riders remain in Ocala. This event is the final run for many horses headed the the Land Rover Kentucky 3 Day Event, so plan on coming out to see some top international competition! Buck Davidson, Will Coleman, Liz Halliday-Sharp, Clayton Fredericks, Hannah Sue Burnett, Kyle Carter, Caroline Martin, Leslie Law, Hawley Bennett-Awad, Jessica Phoenix and Colleen Rutledge are just a few of the top level riders entered. The event will host national horse trials as well as the FEI CCI divisions which run up through 3* level. The international riders arrived for stabling at the facility on Wednesday, with their competition running Thursday through Saturday, and the horse trials will run their 3 phases Friday through Sunday. Ocala Horse Properties will be on site to cheer on our OHP Team Rider, Liz Halliday-Sharp who will be competing with 6 of her horses, including Deniro Z, who will be doing a combined training run at the Advanced level (A-CT) before heading to Kentucky. The combined training division is specifically designed for horses to just practice the dressage test and stadium show jumping in final preparation for the Kentucky 3 Day Event. To see the entire schedule for this weekend’s horse competition including the schedule, ride times and live scores please go to the Florida Horse Park’s website at THIS LINK. 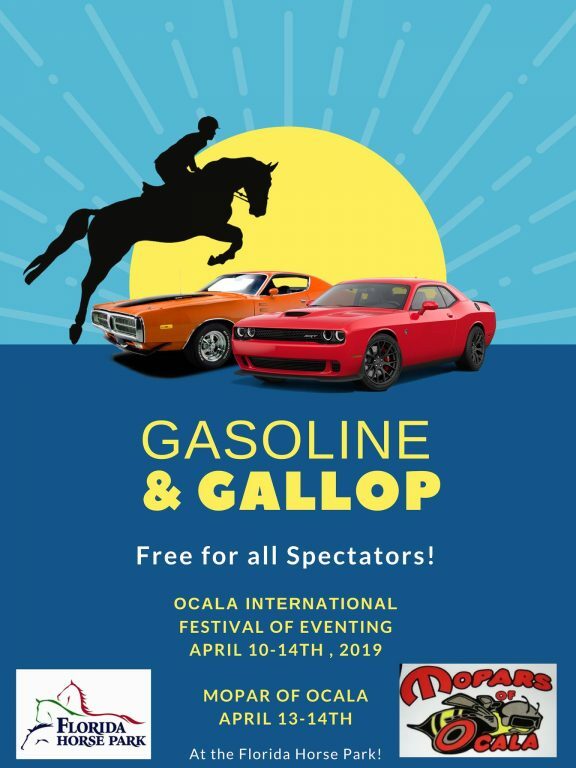 In addition, the Ocala International Festival of Eventing and the Mopar’s of Ocala are teaming up for a fun weekend of Gasoline & Galloping, which is FREE to spectators! Watch Horsepower simultaneously coincide with Horse Power as international riders compete in all three phases of eventing while classic cars are showcased under the covered arena! There will be lots of vendors for shopping and refreshments, and on Saturday there will be music and fun during the MoParty which runs all day! The Florida Agriculture Center and Horse Park is a 500-acre, multipurpose facility and one of Central Florida’s premiere venues for equine, agricultural, educational, and sporting events held throughout the year. Don’t fret, if you can’t make this weekend’s event, there are plenty of other opportunities throughout the spring and summer. To view all of the upcoming spring/summer events please go to the Florida Horse Park’s website link HERE or their Facebook Page @FloridaHorsePark. 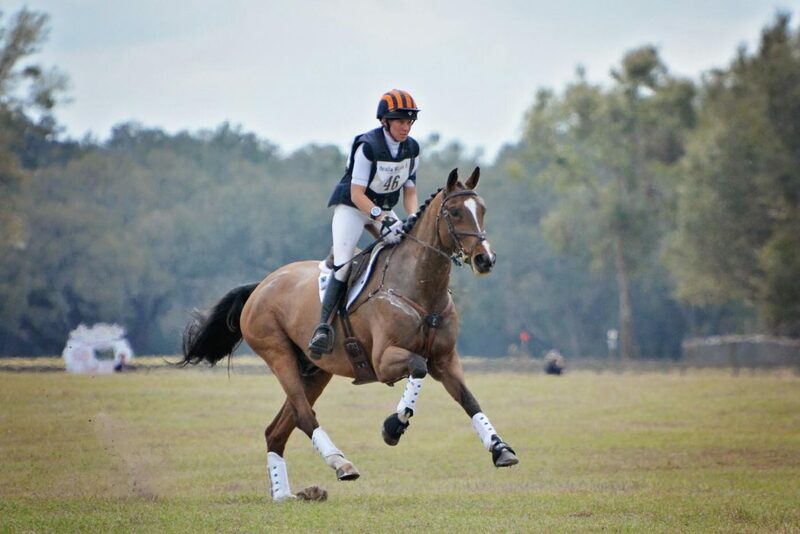 Ocala Horse Properties wishes all competitors the best of luck this weekend and throughout the remainder of the season!